Oreochromis niloticus or tilapia is the second major freshwater aquaculture bred after catfish in Malaysia. By understanding the feeding behaviour, fish farmers will able to identify the best feeding routine. In the present investigation, photoelectric sensors are used to identify the movement, speed and position of the fish. The signals acquired from the sensors are converted into binary data. The hunger behaviour classes are determined through k-means clustering algorithm, i.e., satiated and unsatiated. The Logistic Regression (LR) classifier was employed to classify the aforesaid hunger state. The model was trained by means of 5-fold cross-validation technique. It was shown that the LR model is able to yield a classification accuracy for tested data during the day at three different time windows (4 h each) is 100%, 88.7% and 100%, respectively, whilst the for-night data it was shown to demonstrate 100% classification accuracy. The final outcome of this research project and the successful of development of this useful system required a lot of guidance and assistance from my project supervisor. Meanwhile, I would like to express my gratitude to lab instructors and my friends for providing practically knowledge, skills and guidance when doing the mechanical work in lab. 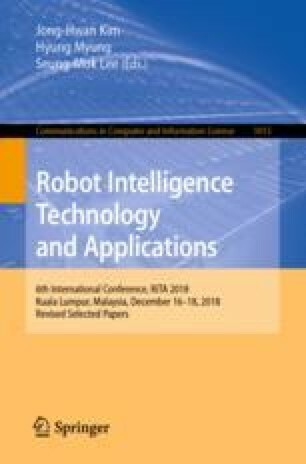 This work is partially support by Universiti Malaysia Pahang, Automotive Engineering Centre (AEC) research grant RDU1803131 entitled Development of Multi-vision guided obstacle Avoidance System for Ground Vehicle.